Late-career highlights can warrant an inclusion in the A Scene In Retrospect feature just as much as early masterpieces. Case in point: In Flames‘ ninth album A Sense of Purpose shows the Swedish melo-death legends on what can now be described as their final creative peak before their decline into sterile pop-affine mediocrity. Released in 2008, the record anticipates the road ahead in many ways, but keeps things grounded in the melodic heaviness In Flames originally built their brand on. To discuss this (as of now) last musically remarkable hurrah of this groundbreaking band, I have asked EIN PR/social media manager Valentin and staff writer Jake to provide their thoughts on A Sense of Purpose – you can read the results in the following. Please enjoy! Throughout my musical journey, I have had many ‘favorite’ bands. At one point In Flames sat atop the list of artists that I would consider to be my most beloved. Their mix of groovy and harsh with killer vocals and a sense for great songwriting helped them retain this top spot for a very long time. As time has passed,they have been bumped down a few rungs, but that’s due to my change in taste more so than their output. A Sense Of Purpose is an album that stands as one of their records that always hangs around as one of their most interesting and diverse. It was on this album that their shift in style became a little more apparent, with more prominent use of electronics and traditional vocal approaches. This shift provided something that for me that helped me appreciate In Flames even more than before. First and foremost, vocalist Anders Friden gets to really stretch his range on these songs. “Disconnected” showcases that his harsh vocals are still in play, but that he can also clean them up enough to create a sense of melody and beauty at the same time. “Sleepless Again” features some amazing harmonies and a really cool synth lead that years before would never have been included. Their openness to making some subtle transitions in their sound allowed for some really beautiful moments that we wouldn’t have gotten otherwise. It also should go without saying that this version of In Flames were riff lords, as “I’m The Highway” and “Drenched In Fear” continue to remind us to this day. As with all releases up to this point, the riffs have a way of sticking with you and and getting that head banging with ease. The mix and mastering of A Sense Of Purpose is note-perfect with really punchy guitars and thumping bass. History has shown that this is a pivotal album in the band’s discography, as they embraced some new sounds and ideas. It will stand as one of my favorite melodic death metal albums of all time, and if you don’t like that, don’t tell me, tell my ghost. In Flames have always been a very special band to me for various reasons. Soundtrack to Your Escape and Colony were some of the very first CDs I ever bought, “Come Clarity” had some of the very first metal riffs I learned on guitar, and they generally were one of the first ‘real’ metal bands I ever listened to. Now I was listening to all of their albums quite regularly back in my teenage years, but I only liked a few songs off each one – I never really had the feeling of listening to a ‘perfect’ In Flames record. So as the days went by, I discovered new bands and almost completely forgot about In Flames – until my 13th or 14th birthday when a friend of mine (thank you, Lasse) gave me a copy of A Sense of Purpose as a present. Immediately feeling intrigued by the insanely beautiful cover art, I couldn’t wait to give it a listen, and when I finally spun it for the very first time, it was love at first sight. 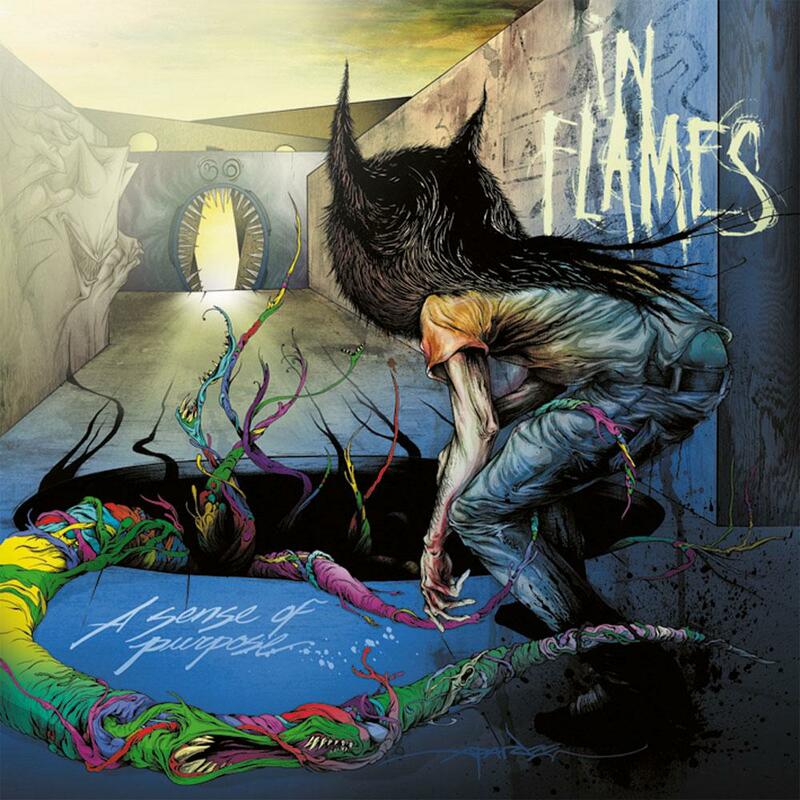 A Sense of Purpose literally combined everything that I liked about In Flames‘ earlier works and took it to the next level: it’s filled withcountless great guitar riffs, features some of Björn Gelotte’s best lead work, and sees Anders Fríden in his prime. Songs like “Disconnected”, “Alias” or “Delight and Angers” are some of my favorite In Flames tunes and might as well make an appearance in my top 100 songs of all time list (if I ever were to compile such a list). What also sets this album apart from their older records is the very organic, almost ‘warm’ production that never fails to get me in a good, almost summer-like feeling. The overall flow is very good, and even after eleven years of regularly listening to it, I still find it very entertaining to listen to (which is probably the best compliment one could make when it comes to music). I’m well aware that A Sense of Purpose may not be the most popular album in In Flames‘ fan scene, but for me, it actually is my favorite work of theirs, and I will most likely cherish it forever. That’s all for today! What are your thoughts on this band and album? Is there any other In Flames record you would’ve expected to pop up on the A Scene In Retrospect radar over A Sense of Purpose? Let us know in the comments! And while you’re there, you can also leave us some suggestions for records to include in this feature if you like. Previous PostUrza - "The Omnipresence of Loss"
Next PostRaiju - "Non Sequitur"